Happy April! Is that spring that I smell? My favorite produce season is back from bundles of asparagus to crunchy snap peas. I put together this simple, fresh raw salad that is so easy to assemble, but breathtaking to look at. Shaving asparagus is one of my favorite ways to enjoy this seasonal vegetable. Make sure to pick thick asparagus in order to make those asparagus ribbons. Just like you would peel carrots or potatoes, shave the thick asparagus from the asparagus top to bottom. Twist those asparagus ribbons for a gorgeous presentation as well. Feel free to add whatever spring vegetables that look fresh. Using fresh, spring vegetables is the key for this salad. Serve it with a side of Za’atar crusted chicken and cucumber lemonade to have your first spring backyard dinner! Happy Spring! Keeping lettuce leaves whole; pull off from the stem and place on a plate. Start layering the salad by sprinkling the snap peas and scallions. Shave the asparagus stem with a peeler and decorate the lettuce with the asparagus ribbons. Do you guys love goat cheese? I’ve always loved it in every form — appetizers, dipping sauce, and even marinade. Since I like goat cheese so much, I sometimes sprinkle it in my salad, but when I do it, the crumbled cheese doesn’t get distributed evenly. I want to taste goat cheese in my every bite, you know? So, I decided to turn it into a dressing to keep its tangy, creamy flavors while making it easier to toss around my salad. By doing so, every bite has a bit of that tangy, goat cheese flavors without being clumpy. This creamy dressing will be an instant flavor boost, making any boring salad into something incredible! This is as seasonal as it gets! Tomatoes are at their pick right now. And, so are sweet and juicy corns. What a better time to throw all these seasonal vegetables together to make a delicious salad! I added a little Middle Eastern flair to the salad by adding grilled halloumi. Halloumi is the only cheese you can grill, and once you grill it, it changes its texture and flavors completely, which goes so well with the rest of the salad. Make this super simple, but a super flavorful salad for your next party! Husk and grill the corn for 3 minutes on each side, a total of 8-9 minutes or until charred. When corn is cool, cut kernels from cobs into a bowl. Reserve. Slice the halloumi into 1-inch slices. In a large saute pan on high heat, sear the halloumi for 3 minutes on each side, or until golden. In a large bowl, combine the quartered tomatoes, grilled kernels, and seared halloumi. Toss with lemon juice, olive oil, and salt. Yes my favorite fruit is watermelon - it's juicy, delicious, and refreshing. My least favorite food is salad. So I decided to combine the best with the worst. A savory and sweet crunchy salad that tastes like the perfect summer day! 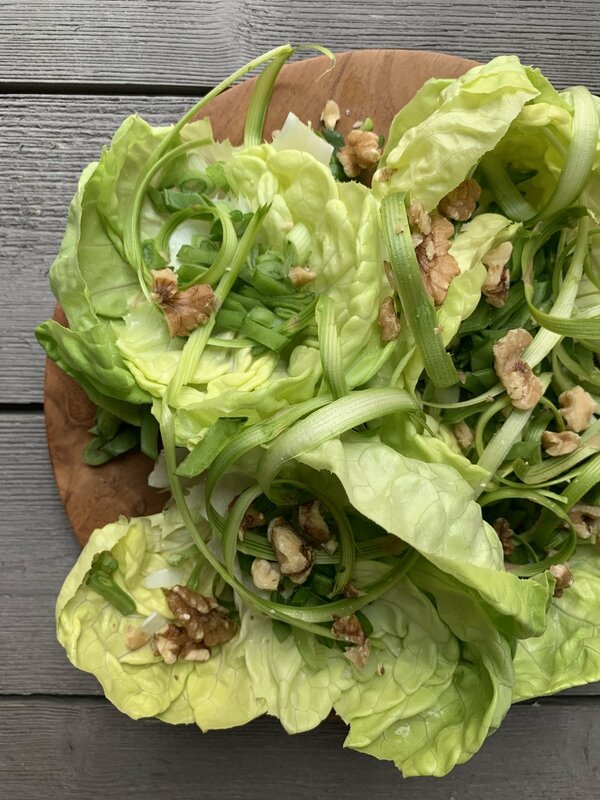 Make it for your next BBQ, or gathering and watch everyone be like "OMG that is genius - who made that salad", all I ask that you share my website. Cheers! Slice the watermelon, into 1-2 inch slices. Remove the rind, and cube into 1 inch cubes. 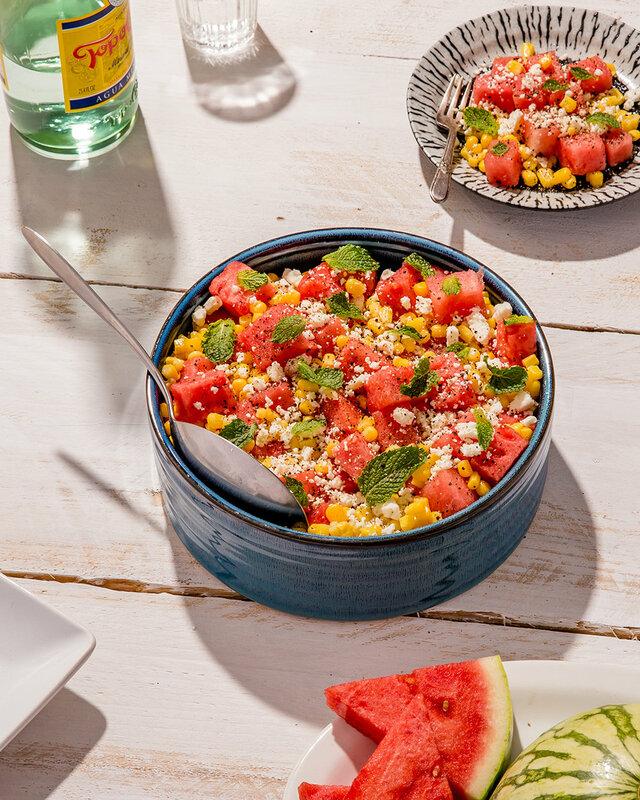 In a large bowl combine the watermelon, corn, feta, and mint. Toss until well combined. Add lime juice, salt, and lots of freshly cracked black pepper. Toss again, and you are ready for summer's best salad!